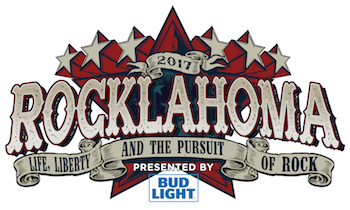 A massive music lineup has been announced for the 11th year of Rocklahoma, presented by Bud Light, May 26, 27 & 28, 2017 at "Catch the Fever" Festival Grounds in Pryor, Oklahoma, just outside Tulsa. Soundgarden, Def Leppard, and The Offspring lead the music lineup for America's Biggest Memorial Day Weekend Party, which features the best current rock artists and classic bands. The three-day camping festival features music on three stages, as well as a campground stage to keep the music going all night long. With onsite camping amenities and unparalleled VIP packages, Rocklahoma lives up to its motto of "Life, Liberty & the Pursuit of Rock." In 2016, Rocklahoma had its biggest year ever, with over 70,000 fans attending the festival's 10th year. "Every year we try to find that delicate balance of talent at Rocklahoma, and the lineup we've put together for 2017 will not disappoint," commented Joe Litvag, executive producer of Rocklahoma. "Def Leppard has been on the wish list of our most loyal fans since the festival was created back in 2007, and to couple them, one of the most influential British rock bands of the last 30+ years, with Soundgarden, one of the most respected American rock bands of our generation, is really special for us. Add to the mix some of the hottest developing talent like Pierce The Veil, The Pretty Reckless, Nothing More, and Rival Sons, and I think we've accomplished the goal of achieving one of the most diverse festival lineups of the year anywhere. It's going to be a really memorable weekend!" Rocklahoma is supported by our rockin' sponsors: Bud Light, Monster Energy and River Spirit Casino. These partners, along with many others, will feature interactive experiences, artist meet & greets, and other unique fan engagement opportunities throughout the festival. 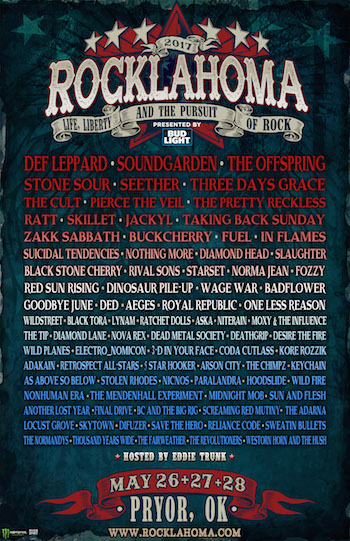 Rocklahoma is produced by AEG Live, and is part of the World's Loudest Month concert series, which features the biggest names in rock music performing in eight distinct U.S. concert atmospheres during six consecutive weekends in April, May and June of 2017.